Imagine the prestige of owning your own successful advertising agency. You will be an independent business owner that provides small businesses with over 20 different advertising and marketing services. What makes us unique is that we schedule appointments for you with potential clients and generate leads for your business. You will not have to make cold calls. At Advertising Consultants we have been helping our clients with their advertising and marketing needs for over 10 years. We are now expanding nationwide and looking for the right people to join our team. We provide a turn key business package that has everything you need to be successful and we do not charge any royalty fees. We will send you a FREE detailed information package and overview of the business. The package contains a full color brochure and DVD video. 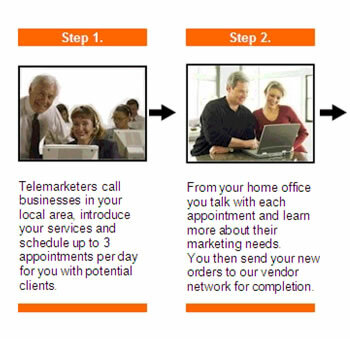 Click on Request Information for FREE info on how to open a Advertising Consultants franchise today! Please Note: This Advertising Consultants franchise opportunity and other franchise business opportunities, businesses and franchises for sale on this web site are not to be considered as an "offering", "franchise offering", suggestion or recommendation by Franchise Leader™. This advertisement depends entirely on the truthfulness of the information provided by our advertisers which includes, but is not limited to, franchisers, franchise brokers, franchise consultants and business brokers. Franchise Leader™ recommends that you consult a lawyer, financial consultant, accountant or professional advisor before buying a franchise or business opportunity or any type of business. By using this form or any part of our website, you have agreed to all terms and conditions of Franchise Leader™. Please review our Terms & Conditions for more information.